William S. Burroughs Shows You How to Make "Shotgun Art" | Open Culture William S. Burroughs Shows You How to Make "Shotgun Art"
There is no exact process. If you want to do shotgun art, you take a piece of plywood, put a can of spray paint in front of it, and shoot it with a shotgun or high powered rifle. The paint's under high pressure so it explodes! Throws the can 300 feet. 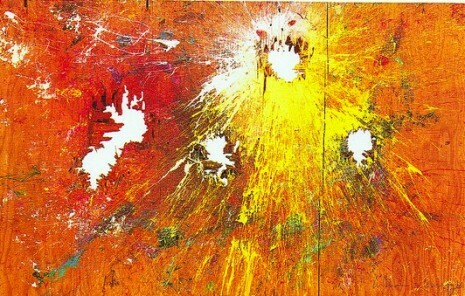 The paint sprays in exploding color across your surface. You can have as many colors as you want. Turn it around, do it sideways, and have one color coming in from this side and this side. Of course, they hit. Mix in all kinds of unpredictable patterns. This is related to Pollack's drip canvases, although this is a rather more basically random process, there's no possibility of predicting what patterns you're going to get. This is, admittedly, a very lo-fi film. It appears to have been shot on super-8, and about two thirds of the way through, the camera flips upside down, then seems to have been tossed into a car. The sound goes out, and the last minute captures a cloud-strewn Kansans sky speeding by in silence. It’s a strange and captivating piece of found art that, like Burroughs’ work, contains casual violence, odd perspectives, herky-jerky editing, sudden confusion and upheaval, and rare moments of beauty. Many many years ago I ran into William Burroughs at Allen Ginsberg apartment. At some point during the tedious evening, I asked Burroughs if he would stand still while I placed a bottle on his head so I could walk across the room and shoot the bottle off his head. The gun-loving Mr. Burrough’s turned even more ashen than he usually was, then the gangling, gray-suited William Burroughs turned tail and fled the apartment On the way out he told Allan that I was crazy and he should watch out because I was dangerous. I didn’t own a gun. It was just a ruse to break up a tedious Ginsberg party. Me? Dangerous? Ironic words from a man who had shot and killed his wife. I have one of the shotgun art on plywood pieces from his first show hanging in my living room. Absolutely fantastic. A bit odd at first but it grows on you . it is called the red barn . As referenced in the origional catalog. .
That’s a rather cruel joke to play on someone who suffered from an enormous amount of guilt his entire life for the accidental death of his wife. Greg says Burroughs suffered enormous guilt for killing his wife. It wasn’t a joke. I knew Burroughs would turn tail and run away. No guts. If I had the opportunity to shoot abbot off his head, I would have done it gladly. Burroughs weaved his way in because he was the only one of us with money, and plenty of it. The only time Burroughs suffered is contained in something he said: “Heroin is no problem unless you run out of it.” He was a pretty good writer, like say the opening of Dead Fingers Tell. Late in life Burroughs became the literary light among people who couldn’t read. That is not Kansas it is New Mexico. The two people other than WSB in the film are Steven Lowe and his partner. Lowe was a friend of WSB and owned a gallery in Santa Fe, NM where this was filmed. Later he moved to Lawrence, Ks. I knew and worked with Burroughs ten years in Lawrence. Miss him today. Mr. Douskey is full of crap. Burroughs never had a lot of money until late in life when he sold some art in Japan and his social security kicked in. Period. Franz, that was a terrible joke and poorly timed, I’ve read almost all of burroughs’s work and most of the books written about him. If you read even a few of those you would realize that Jim McCrary is absolutely correct about his money situation! The mans thinking and writing was soo on point with the kind of controlled reality we are all living in. He was way beyond his time. You could say he was a man out of time. Also to say a man like William Burroughs had no GUTS, is pretty much admitting how little you really know.